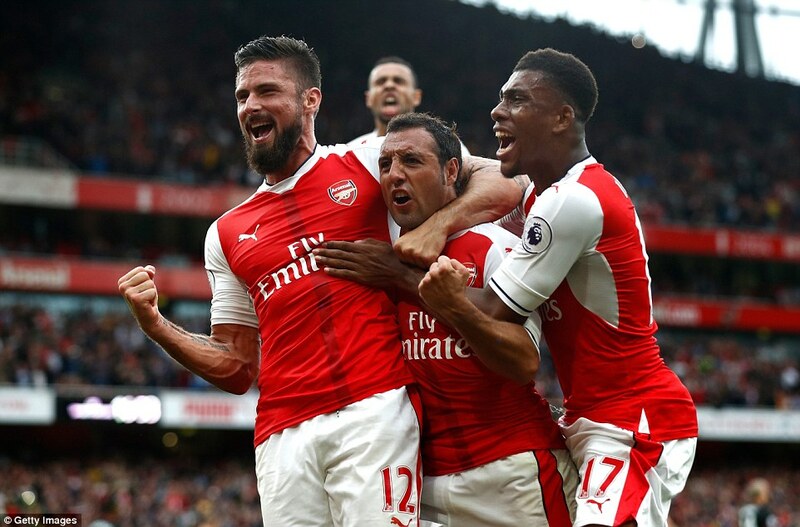 A lot happened at Arsenal Football Club over the past week, since that 3-1 win over Watford at Vicerage Road. With rumours making their rounds that Arsenal had blown their chance to sign German international defender Shkodran Mustafi from Valencia, after dilly-dallying over his price, the two clubs sat down and negotiated a price. £35 million later, and Arsenal had a world class centre back in their ranks. That wasn’t all. With the fans crying for some firepower up front, the club fulfilled their wishes, by purchasing £17 million striker Lucas Perez from Deportivo la Coruna. He may not be the Higuain or Lacazzette we all desired, but hey, he scored 17 goals and provided 8 assists, for what is, at best an average La Liga club. He definitely could do better with the likes of Cazorla, Ozil and Sanchez playing behind him. The biggest news, however was the departure of Jack Wilshere on loan to Bournemouth. A move that raises a lot of questions. Has the club lost patience with his injuries and his promise of being the next big homegrown thing to come out of the club. Press reports say it was a move Wilshere requested, in order to gain first team football and build on his fitness, so he can cement his place at Arsenal in the long run. Makes sense, to some extent, considering Eddie Howe likes his teams playing free flowing football, and he will be away from the usual scrutiny he gets every week with Arsenal. Coming to the match itself, the manager started both his new signings. Rob Holding made way for Shkodran Mustafi at the back, while Lucas Perez started up front, with Alexis on the bench, the manager keeping an eye on the big Champions League opener vs Paris Saint Germain. Elsewhere, Francis Coquelin returned to the starting lineup, with Granit Xhaka making way. It was Southampton, who started brighter, with Jay Rodriguez heading just over the post. Arsenal were guilty of giving the ball away far too often. Mesut Ozil, still finding his feet this season, found himself unmarked in front of goal, before losing his footing. Nacho Monreal then fouled just outside the penalty box, in the 16th minute. Serbian international Dusan Tadic’s freekick struck the underside of the post, with Petr Cech completely beaten. It bounced off the back of the stopper and rolled over the line, as the visitors took a 1-0 lead. A free-kick from Santi Cazorla was header over by Theo Walcott, before the Spaniard was booked for dissent. Dutch international Virgil van Dijk then had to clear the ball to safety from a Monreal effort. 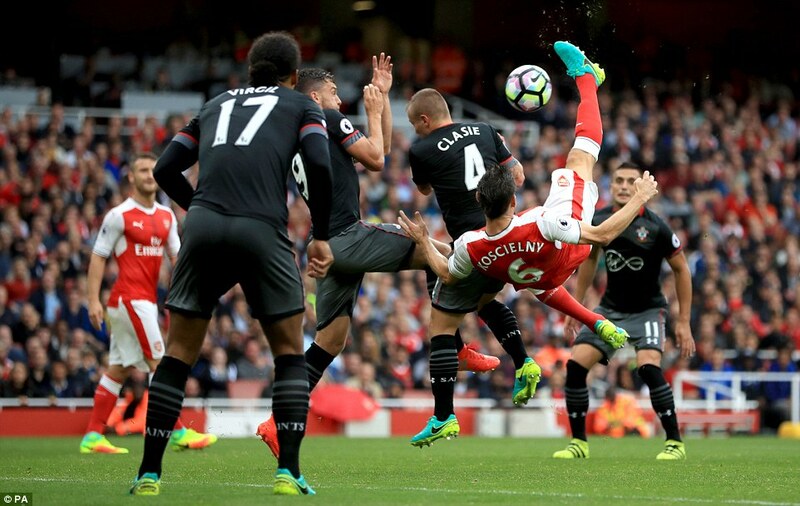 Seconds later, the Gunners were level, when from the resulting corner, Laurent Koscielny, celebrating his birthday, pulled off an overhead kick. Ridiculous stuff from a central defender. 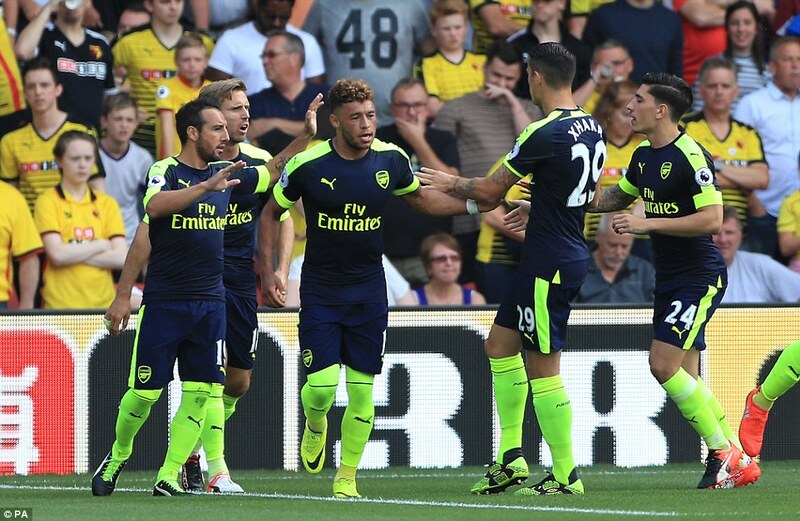 The goal changed the momentum into Arsenal’s hands, as the home side opened up. Cazorla played in a couple of wonderful cross field balls, before an Ozil effort from a Bellerin cross was blocked. Then, former Saint Alex Oxlade-Chamberlain saw his shot deflecting just over, as the first half came to a end at 1-1. The wily Shane Long came on for Southampton in place of Jay Rodriguez, at half time. Arsenal had the first chance of the second half, as Ozil failed to control a Walcott pass inside the box. Lucas, who had had a quiet debut till that point, saw his shot blocked by Ryan Bertrand, having been set up by Ozil. Santi Cazorla had to be alert to break a dangerous Southampton counter, before Bellerin’s effort went just wide, as Arsenal probed Southampton in search of a second goal. On 62 minutes, the manager bought on Olivier Giroud and Alexis Sanchez in place of Lucas Perez and Alex Oxlade-Chamberlain. Shane Long then had a great chance to put the visitors ahead, but he squandered his chance, with only Cech left to beat. The dynamics up front seemed to have changed since the introduction of Giroud and Alexis. First, the Chilean saw his shot go just over the bar, from an Ozil layoff. Then, he combined with Giroud, only to see his effort being blocked this time round. At the other end, Shane Long could only head over from a free-kick. On 75 minutes, Alex Iwobi came on for Theo Walcott. A mistake from van Dijk allowed Alexis to set up Cazorla, but the Spaniard by the slippery pitch at the Emirates, something even Giroud fell prey to. 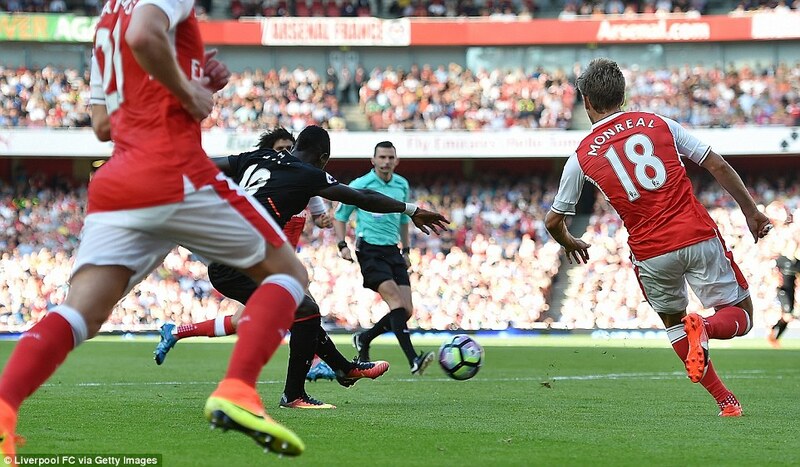 An effort from Monreal was deflected wide, as both sides looked to score the elusive winner. Shane Long missed another guilt edged chance at the other end, moments later. A free-kick from Santi Cazorla floated in, but Giroud couldn’t make much of it, under close scrutiny from Southampton’s towering defensive pair of Jose Fonte and Virgil van Dijk. In the dying moments, when it seemed like points would be shared, a Cazorla cross caused chaos in Southampton’s area. First, Koscielny was bought down and Giroud was fouled, the referee awarding a penalty for the latter incident. It seemed like Koscielny would need some treatment, and he was momentarily taken off the pitch. 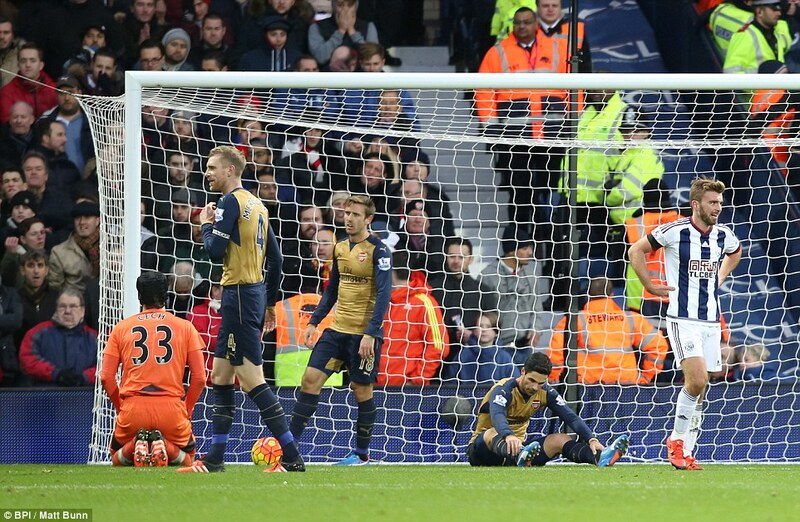 Southampton tried to ward off Cazorla’s concentration, as he stepped up to take the spot kick. It didn’t matter though, as the ball found the back of the net, in the 94th minute. It was too little, too late for the visitors to score an equalising goal at this point in the match. A much needed 3 points, as Arsenal now travel to Paris for a daunting game against the all conquering PSG. Things have been pretty quiet on the blog lately. In fact, very quiet. 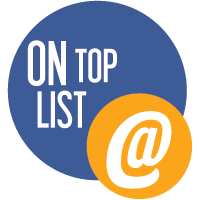 Last season, I barely struggled to put any timely articles up, and I will sincerely attempt to update more often. With a quite boring Interlull weekend gone by, it was again time for some much needed Premier League action, as Arsenal made the short trip across London to play Watford. The Hornets, now managed by Walter Mazzari, have had a mixed start to the season themselves, drawing away at Southampton, before losing a hard fought game at home to Chelsea. With no new signings imminent at the back, new signing Rob Holding kept his place in the centre of defence, alongside Laurent Koscielny. 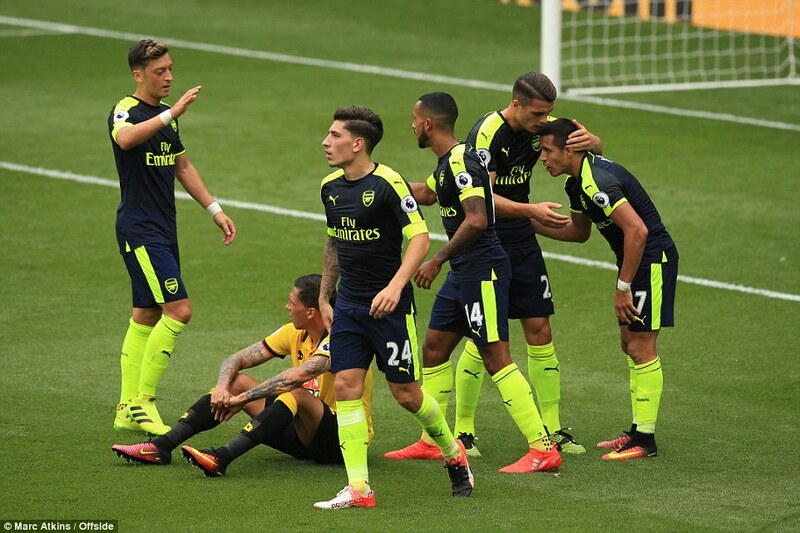 Elsewhere, the manager decided to start with Granit Xhaka in the centre of midfield, alongside Santi Cazorla, in place of Francis Coquelin; as Mesut Ozil started his first game of the season. A quiet start preceded a 8th minute penalty in favour of the Gunners, when Nordin Amrabat barged into Alexis Sanchez in the penalty box, with his elbow. Santi Cazorla obliged with a neatly taken penalty, as former Spurs stopper Heurelho Gomes guessed wrong. Cazorla then saw his shot go across the goal, having been setup by Alexis. Walcott, who was on the other end, managed to get to the end of it in the nick of time, only to see it strike the knees of Gomes and out. At the other end, Laurent Koscielny made it awkward for Petr Cech, with his attempted clearance threatening to go in. The Czech stopper, however, managed to palm it away. Watford enjoyed some possession as Arsenal were happy to allow the home side to play in front of them. Defender Christian Kabasele’s header went just wide. Moments later, Gomes pulled off two saves in quick succession, first when Ozil played in Alexis, and the Brazilian stopper used his feet to save; and then a shot from Ozil which he saved from his near post. It didn’t matter though, as Arsenal were 2-0 up within minutes of that. Hector Bellerin played in Theo Walcott, whose cross was clumsily bundled over the line by Alexis Sanchez. Really doesn’t matter where they come from. Granit Xhaka was impressive in the first half, putting in tackles and distributing the ball around with consummate ease. He set up Walcott, but Gomes managed to pull off another save. Xhaka, then created space for Alexis on the left, drawing defenders into him, and the Chilean crossed into the box, with Mesut Ozil heading home Arsenal’s third goal of the afternoon. 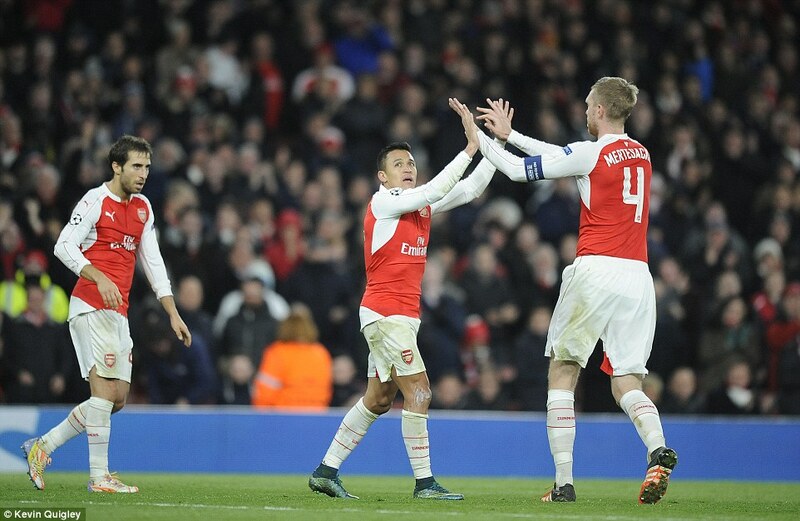 The Gunners went into half time with a resounding 3-0 lead. The second half was a completely different story though, as Watford appeared a transformed team. Record Argentine signing Roberto Pereyra replaced Algerian international Adlene Guedioura, at half time. Arsenal got sight of goal early in the second half, when Walcott cut back a cross, but no one was on hand to meet it. Dutch international Daaryl Janmaat came on for Kabesele in the 51st minute. A right wing cross from Bellerin was too quick for Alexis to catch, before in-form French midfielder Etienne Capoue saw his shot from distance being saved by Cech. Watford would soon pull one back, when Alex Oxlade-Chamberlain was robbed off the ball. Arsenal failed to deal with a cross that came in and Pereyra netted home to make it 1-3. Walcott, then spotted Gomes off the line, and attempted to chip him, but missed. Chamberlain repeated the trick and failed too, when he should ideally played in Alexis and Walcott who were in a better position to score. Matches like these can be decided by thing margins, and Chamberlain’s miss could have proved costly, had Watford’s effort, moments later gone in. A shot from distance was fluffed away by Cech, and Nigerian international Odion Ighalo couldn’t capitalise on the loose ball, as Cech grabbed the ball just in time. Jack Wilshere and Mohomad Elneny came on for Mesut Ozil and Alex Oxlade-Chamberlain, on 70 minutes. Ighalo then attempted an overhead kick, but it went just inches over the bar, as the score remained at 1-3. An injury to Nacho Monreal, meant Kieran Gibbs came on to replace the Spaniard, as the manager looked to close the game. Watford bought on their wonderfully named new signing, Isaac Success, whose first involvement was a header from a corner, which was dealt with by the away side. Xhaka’s international teammate, Valon Behrami, then screwed a shot wide from the edge of the box. Younes Kaboul was then robbed off the ball by Alexis, who too tried to chip Gomes, when he should have played in a better positioned Walcott. In the end, Arsenal made home with 3 points. Finally, a first win of the season, and hopefully the season can kick on from here. Defensive and attacking reinforcements, hopefully to come in the next few days. 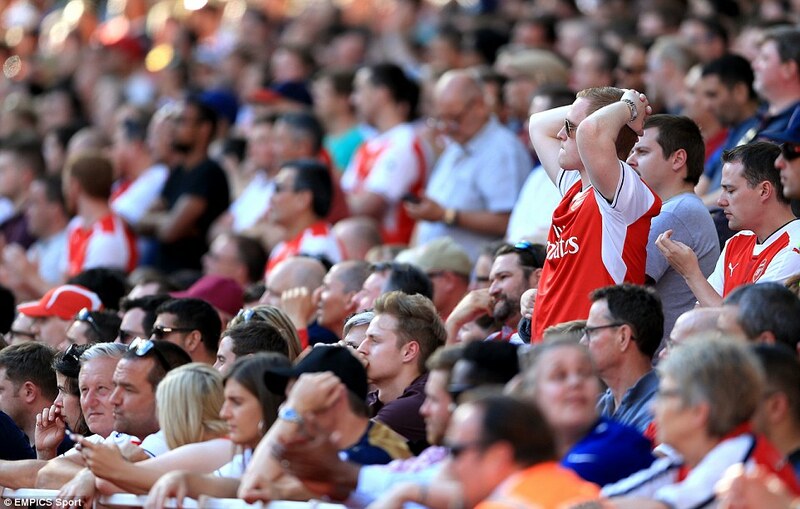 Arsenal’s stuttering start to Liverpool at the Emirates garnered a lot of negative attention to the club and manager. Travelling to the home of the champions, the following weekend was always going to be a tough task, even if Arsenal were the only side in the league to beat the Foxes home and away last season. Leicester had a losing start themselves, when they were beaten 2-1 at Hull City. With Granit Xhaka and Rob Holding, the only signings in the summer, pressure has been increasingly growing on the manager to recruit some much needed firepower up front and cover at the back. With Laurent Koscielny available for selection, it was Callum Chambers, who looks set to go out on loan to newly promoted Middlesbrough, who had to sit on the bench for this one. With Mesut Ozil still being eased into action, the manager decided to start with the trio of Xhaka, Coquelin and Cazorla in midfield, with Alexis plying up front. The injury to Aaron Ramsey in the Liverpool loss meant England duo Theo Walcott and Alex Oxlade-Chamberlain got a starting berth. The defending champions could have gone to a fast start, when last season’s top scorer, Jamie Vardy, ran straight at Koscielny, earning the hosts a corner. Moments later, Cazorla’s shot deflected just wide. Leicester allowed Arsenal enough time on the ball, in the first half, choosing to hit on counters, a tactic that won them bucketloads of games last season. Francis Coquelin picked up a yellow for a foul on Vardy, midway through the first half. On 25 minutes, a curling effort from Chamberlain flew just wide, while Alexis and Xhaka failed with efforts from distance. On 30 minutes, Arsenal almost had the first goal of the match, when a Cazorla free-kick nearly creeped it’s way in, only for Kasper Schmeichel to make an acrobatic save. At the other end, the pace batteries of Riyad Mahrez and Jamie Vardy were causing little trouble to Arsenal, especially with the expert defending of Koscielny. 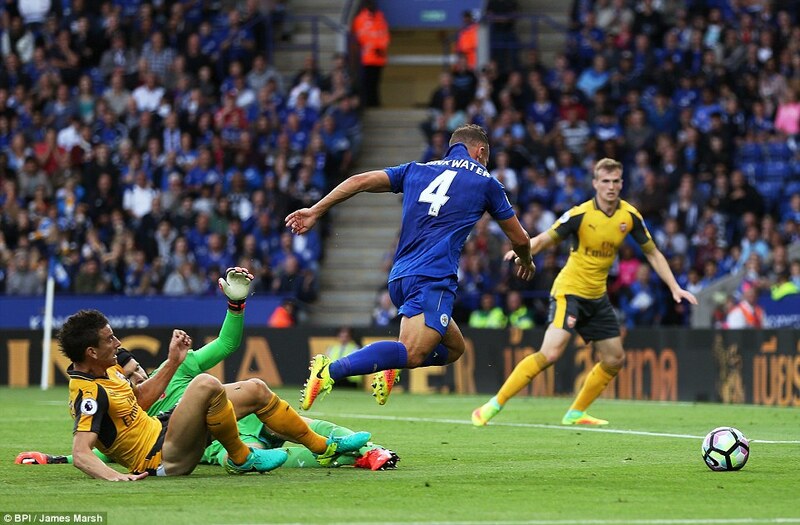 On one occasion, Mahrez set up Vardy, who was thwarted by a diving Petr Cech. 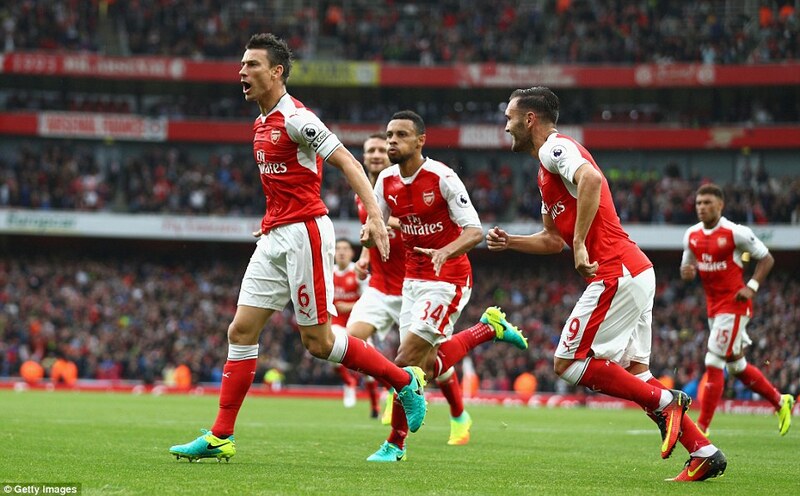 Koscielny then had to be aware to hoof the ball away from an approaching Danny Drinkwater. The home crowd tried to ruffle the feathers of Mark Clattenburg, crying for a penalty, but he was having none of it, as the half came to a close at 0-0. Francis Coquelin was walking on very thin ice, early in the second half, when he hacked down Mahrez near the edge of the box, but he escaped punishment. Mahrez duly fired his free-kick over the post. The game increasingly looked like the first goal would win it, and both sides asked questions of each other. A Xhaka allowed Vardy a free run, but with Koscielny for close comfort, the England striker couldn’t score. The manager bought on Jack Wilshere and Mesut Ozil, in place of Granit Xhaka and Santi Cazorla, to infuse some freshness in midfield, on 72 minutes. 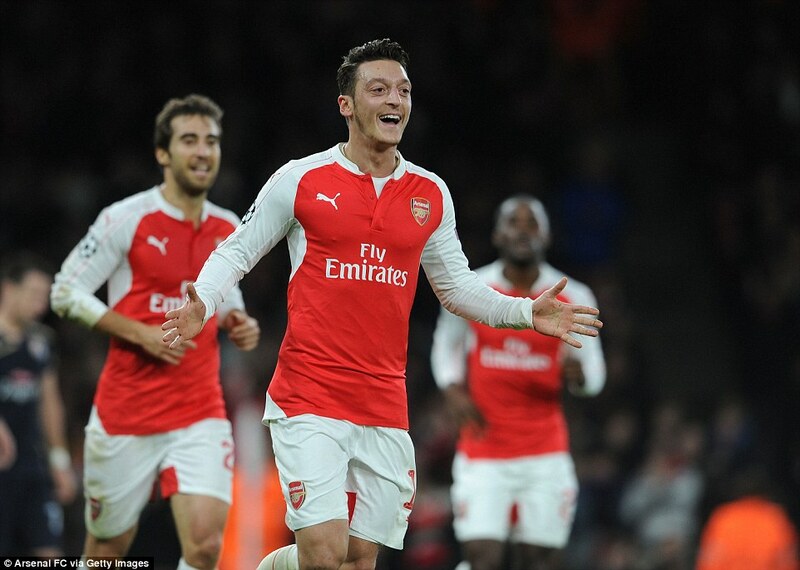 Ozil masterfully orchestrated an attack, but it ended with a goalless left-footed shot from Theo Walcott. Olivier Giroud, then came on for Alex Oxlade-Chamberlain. Minutes later, Walcott was guilty of missing a great opportunity, when he should have really passed to Olivier Giroud, having been set up by Hector Bellerin. The last five minutes were frantic in the least. Schmeichel saved from Ozil, who was set up by by Alexis. Leicester’s genuine call for a penalty was turned down when Ahmed Musa was bought down by Bellerin in the box. Walcott then failed, rather miserably with a chip. A Riyad Mahrez shot was then parried on to the post by Cech, before the last effort of the game fell to Drinkwater, whose freekick just ended up bouncing off Arsenal’s wall. Into the international break we go! In the end, it was all too predictable. Another season opener, and more moans and groans from the Arsenal faithful, urging the club to splash some much needed cash. If last season reminded us what we lacked in our team, last evening was a reminder of how unprepared the squad looks ahead of what looks like the toughest Premier League season in recent history. With Petr Cech our only signing last season, we ended up losing to a West Ham side on opening day last season. A West Ham side that had a 16 year old midfielder, Reece Oxford, debutant Dimitri Payet and Birmingham reject Mauro Zarate in their starting lineup. Even a late Alexis cameo wasn’t enough to salvage anything from a 2-0 loss. 3 years back, we lost at home to Aston Villa, after going down to 10 men. The age old argument that our first day performances are affected by the activity in the summer, in this case the Euro’s, Copa America etc. But, that is true for all teams, and not only Arsenal. Add to that, our injury concerns. With Danny Welbeck out for a good part of the year, Olivier Giroud still recuperating from the Euro’s, Theo Walcott being a bit poo, and our only strikers being rookies Yaya Sanogo and Chuba Akpom, it cries in desperation for the signing of a striker. And our pursuits of Messrs Vardy, Lacazette and Higuain indicated that we were going to patch up that hole. But, instead we play Alexis Sanchez out of position as a striker on the opening weekend. A player who loves hogging the ball, in a position where he is now expected to latch on to anything from midfield and win headers against a tall centre back partnership of Dejan Lovren and Ragnar Klavan. Per Mertesacker injured himself in a pre-season game against Lens, and Gabriel recently in a pre-season win against Manchester City at Gothenburg. Yet, we only had two Under-21 England defenders in Callum Chambers and Rob Holding, playing in central defence against a skilful attack that boasted names such as Coutinho, Firmino and £34 million acquisition from Southampton, Sadio Mane. Quite baffling was the inclusion of Aaron Ramsey and Alex Iwobi in the squad. You would have though the manager would have started instead with Santi Cazorla, who has had a full pre-season, and Alex Oxlade-Chamberlain, who has been our best player in pre-season. What is sad is that the deficiencies are there for everyone to see, yet no one seems to be take retrospective action in order to fix those issues, which are plaguing the team. Yes, we have a deep squad. But, quite clearly, we were short on Day 1, a day when you need to put a marker on your ambitions for the season. To the game, then. Arsene Wenger opted to start with Rob Holding and Callum Chambers in defence. 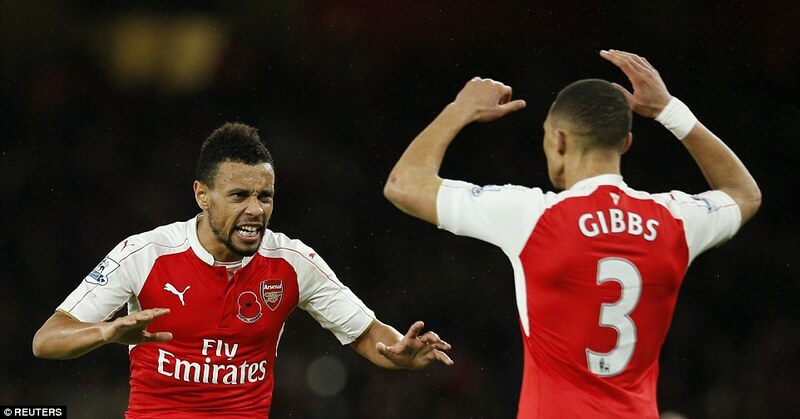 Ideally, a partnership of Holding/Chambers and Monreal, with Kieran Gibbs at left back would have made more sense. In midfield, Francis Coquelin started alongside Mohamed Elneny. Arsenal made the brighter start, on a sunny evening at the Emirates, zipping the ball around in confidence, against a Liverpool side that were happy to allow the Gunners to play in front of them. Aaron Ramsey had the first attempt on goal, after combining with Alexis Sanchez, but his effort went straight at Belgian keeper Simon Mignolet. Nathaniel Clyne, then dragged an effort straight into the safe palms of Petr Cech. Ramsey had another go from way out, when he spotted Mignolet off the line, but it was wayward in the least; when instead he could have played in Walcott who would have been in an one-on-one situation. Roberto Firmino, sporting a ponytail, had a shot from distance, before Adam Lallana was booked for a challenge on Ramsey. Minutes later, Arsenal were awarded a penalty when Spanish left back Alberto Moreno bought down Theo Walcott in the box. The England striker/right winger stepped up to take the penalty, but it was easily palmed away by Mignolet, much to the groan of Gooners all around the globe, including me. With abuses being hurled in from all over, Walcott made up for his earlier miss, as he was played in by Alex Iwobi, after Francis Coquelin robbed Lallana of the ball. He created a bit of space, evaded his marker Moreno and finished past Mignolet at the far post. It was 1-0 on 31 minutes, and Arsenal were in the ascendancy. Liverpool saw a bit more of the ball after Walcott’s goal, and after a string of passes, Firmino could only pull an effort wide. A mistake from Chambers could have proven costly, but Georgio Wijnaldum’s effort was tame. 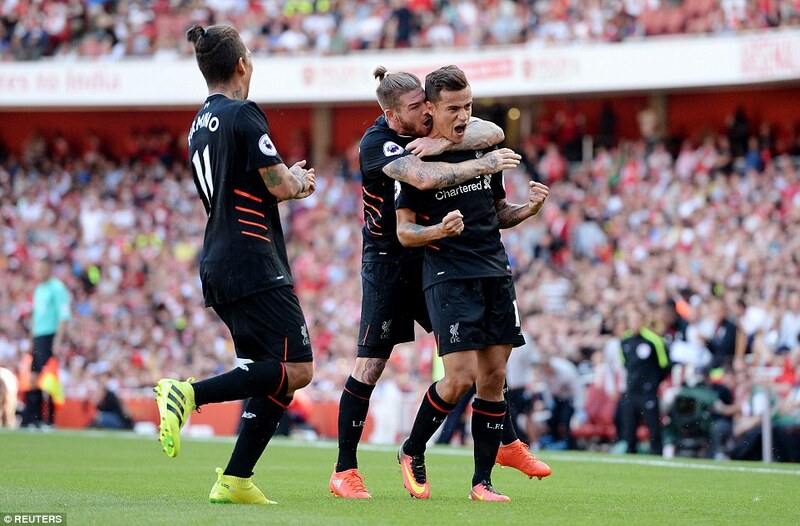 Lovren then picked up a yellow for a foul on Alexis, and the Chilean’s effort was wide from the resulting free kick. Callum Chambers then saw his header from a corner go wide as well. When it seemed like the Gunners would go in to the dressing rooms at half-time, with a 1-0 lead, a free-kick was awarded to Liverpool just outside the box, after Holding was harshly adjudged to have fouled some Liverpool bloke. Coutinho stepped up and found the top corner with aplomb. It was a thing of beauty, and things were back on level terms. By the passage of play, Arsenal deserved the lead at the break. The second half began badly for Arsenal, as Wijnaldum was released into Arsenal’s penalty area, and he spotted the run of Lallana, who calmly chested the ball and put the ball into the back of the net. It was 2-1 to Liverpool. The visiting side then took complete control of the game, and put in a string of passes, which culminated in a Clyne cross from the right, side-footed in by Coutinho to make it 3-1 to Liverpool. The home side and supporters seemed shocked at what they had just seen. But, there was still more to come from a rampant Liverpool. Another cross came in from the right, and Cech was in the right place to save from what would have been a tap-in from Firminho. Adam Lallana couldn’t take advantage of the loose ball. However, in a matter of minutes, Saido Mane bamboozled three fourth’s of Arsenal’s defence, to release a left-footed screamer past Cech on 63 minutes. 4-1 to Liverpool. Arsenal managed to pull one back, though; when Alex Oxlade-Chamberlain, on for the injured Iwobi cut between to Liverpool defenders to put one past Mignolet on the near post. It was a fine goal. Santi Cazorla, also on for Aaron Ramsey tried to infuse some creativity and urgency into the team, and new signing Granit Xhaka also got a chance to strut around, when he came in for Elneny on 66 minutes. Emre Can came in for Coutinho in the 70th minute. An effort from Cazorla went over, before the Spaniard’s free kick was deflected in by Callum Chambers to make it 3-4 on 75 minutes. It seems like Arsenal would complete an improbable comeback, but Liverpool looked organized and allowed little in terms of space, despite playing the error prone Alberto Moreno. Jurgen Klopp threw on Belgian striker Divock Origi in place of Lallana to create an attacking outlet in the 76th minute. Arsenal huffed and puffed, with Liverpool closing most of the attacks down. When Arsenal did manage to put in a good move together, Theo Walcott tripped and fell over the ball, having been in a good position in between two defenders. Another late move collapsed when Santi Cazorla’s pass/cross struck Nacho Monreal to go for a goalkick. All in all, it was a poor start to a season, where expectations seem to be pretty low. A clear indication of lack of preparedness in terms of the squad as well as fitness and match-readiness was on display. But, what a result for Liverpool. 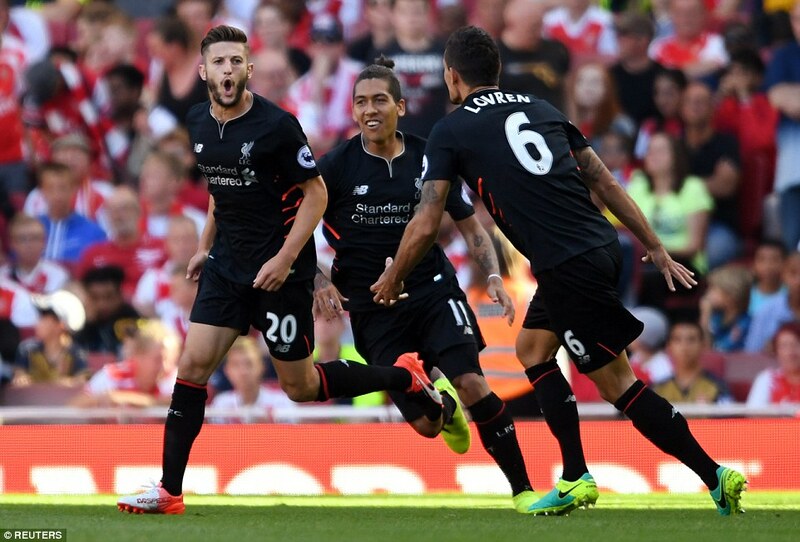 An opening day win at a ground of a rival, scoring 4 goals, including 2 for star man Coutinho. It’s back to the drawing board for Arsene Wenger and Co., as they face a daunting trip to champions Leicester next weekend, who are also smarting from an opening day loss to Hull. Arsenal secured a much required win against Croatian champions Dinamo Zagreb, to keep alive their hopes of qualifying to the next round of the Champions League. Mathieu Flamini started in midfield, in place of the injured Francis Coquelin, while Costa Rican Joel Campbell got a starting berth, in place of the injured duo of Theo Walcott and Alex Oxlade-Chamberlain. Despite suffering a 5-1 mauling at the hands of Bayern Munich, Arsenal’s 2-0 win over the Bavarian giants gave them some hope of qualifying. They would now have to better Olympiakos’ 3-2 win at the Emirates, in the return game in Greece, in order to qualify. But, with the 3-0 win against Zagreb, they have given themselves a realistic chance. 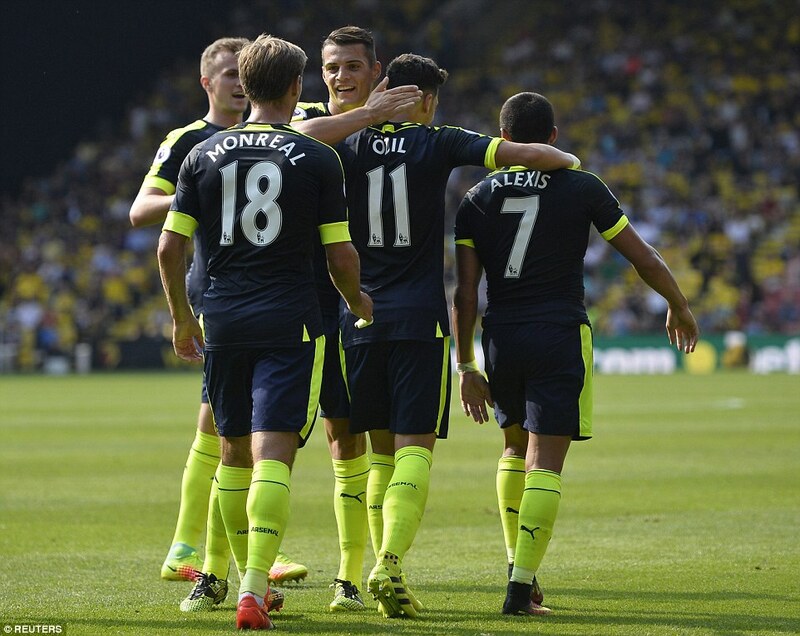 Mesut Ozil headed the Gunners into the lead in the 29th minute to ease the nerves of the home side. 4 minutes later, Alexis Sanchez made it 2-0 and the win was sealed in the 69th minute, when Sanchez finished off a fine team move. Arsenal succumbed to a disappointing defeat at The Hawthorns, at the hands of West Bromwich Albion, leaving them 4th in the table. 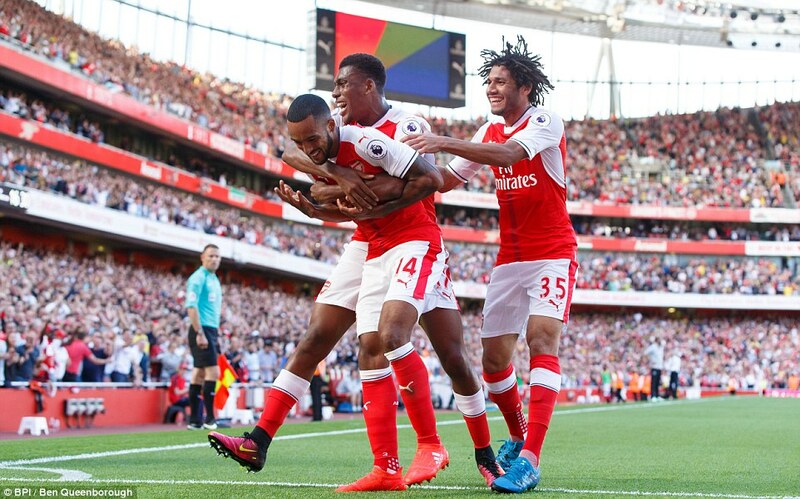 The Gunners enjoyed a near perfect October, defeating Manchester United, Watford, Bayern Munich, Everton and Swansea, but November has been tough, having taken a pounding at the hands of Bayern Munich and a home draw with Tottenham. Arsenal suffered an early blow, when Francis Coquelin had to come off in the 14th minute through an injury, to be replaced by Mikel Arteta. In the 28th minute, Arsenal got the lead through an Olivier Giroud header from a Mesut Ozil free-kick. But, West Brom put on a dogged performance, and turned the match on its head within the space of 12 minutes.On 35 minutes, James Morrison had equalized, with a fine volley, before Mikel Arteta calamitously deflected a James McClean cross into his own net. Arsenal had majority of the possession, in the second half, but to no avail, as a well drilled West Brom defence marshalled by Jonas Olsson, put their bodies on the line several times, to take 3 points. Arsenal did miss guilt-edged opportunities though. Substitute Joel Campbell missed from 4 yards out with only keeper Boaz Myhill to beat, before Santi Cazorla slipped over his penalty. 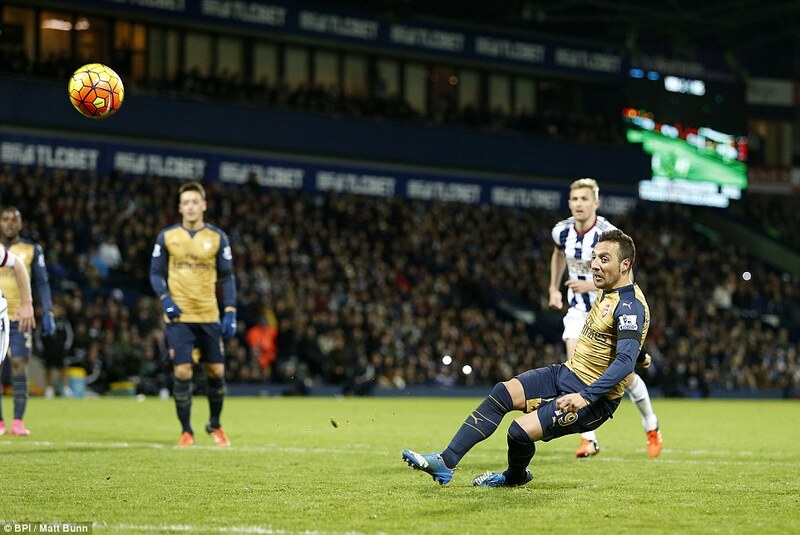 Craig Dawson then blocked a Kieran Gibbs shot from 6 yards out, as West Brom clinched the win. 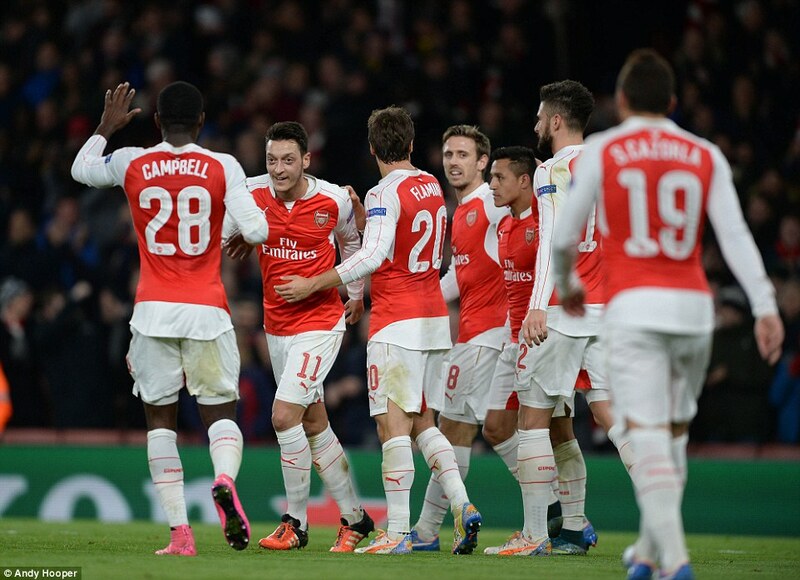 Arsenal now host Dinamo Zagreb, in a must win Champions League clash, before travelling to Norwich City. 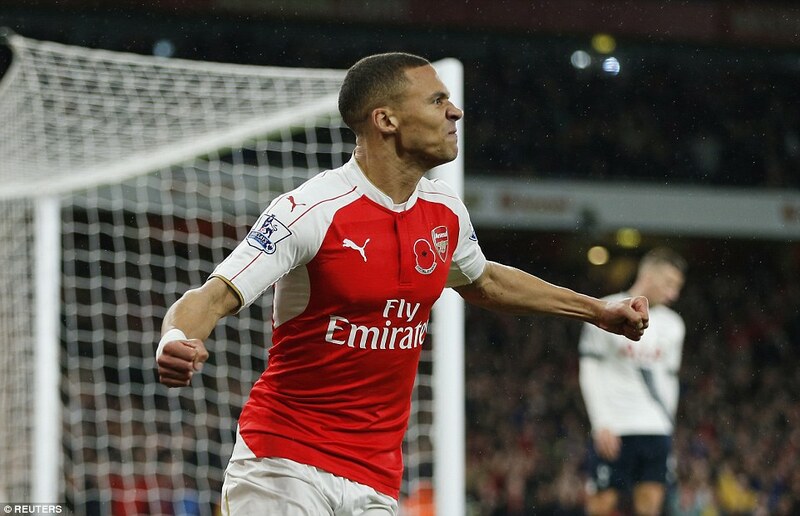 Arsenal rescued a pivotal point in a closely contested derby game against Tottenham. Arsenal, reeling from their 5-1 mauling at the hands of German giants Bayern Munich, knew they were up for a tough game against Mauricio Pochettino’s revitalized Tottenham side. Tottenham have lost just one game all season, away at Manchester United on opening day, while Arsenal needed a point to go level with Manchester City at the top. Mathieu Debuchy kept his place at right-back, with Hector Bellerin still injured, while Laurent Koscielny returned to replace Gabriel at the back. Tottenham kept the ball intelligently and sprayed it around well in the first half, and looked the more dangerous of the two. Petr Cech was called on a few times to make saves, first of which was keeping out Belgian defender Toby Alderweireld’s header, before both Cristian Eriksen and Harry Kane shot wide of goal. Sp*rs took their much deserved lead in the 32nd minute, when Harry Kane raced past Per Mertesacker, having played in by left-back Danny Rose, who escaped the attentions of Laurent Koscielny. Arsenal’s first shot wouldn’t come until the 38th minute. In a tactical ploy, Mathieu Flamini came on for Santi Cazorla, to stifle Tottenham’s star youngster Dele Alli. Arsenal relentlessly went in search of an equalizer, with Giroud going close twice with headers. The goal finally came in the 77th minute, when Kieran Gibbs got ahead of England team-mate Kyle Walker, to meet the end of a Mesut Ozil cross, to shoot past Hugo Lloris. Arsenal had gotten themselves out of jail!